This recipe for Smoked Duck and Summer Truffle Salad with Truffle-Honey Mustard Vinaigrette is easy to prepare, very flavorful, and unique. The smoked duck breast, duck bacon and baked ricotta salata cheese give the salad substance, making a perfect summer meal. There are only a few weeks left for French summer truffle season, so make this recipe while truffles are still available. If you miss the window for summer truffles, you could easily substitute Burgundy truffles. Italian summer truffles can also be used, however, French summer black truffles are more flavorful than Italian summer truffles and they generally have a more pleasing aroma. Summer truffles from Italy tend to be a lighter color inside, though they sometimes look almost identical. In our experience, summer truffles with a very light beige, almost cream colored interior have less truffle flavor than summer truffles which have a darker beige or tan interior. Before you buy summer truffles, find out if they are from Italy, France, or another location. French summer truffles will generally cost more than summer black truffles from Italy; however the difference in flavor and aroma is worth the higher price. Like all truffles, summer truffles should be kept in the refrigerator, wrapped with a paper towel and stored in an air-tight container. Change the paper towel daily. Summer truffles last at least a week or possibly two; however, it’s always best to consume truffles as soon as possible. Summer black truffles are perfect for serving with salad, because the truffles are best when served raw. The flavor of the salad dressing will be absorbed into the truffles, so if you use a salad dressing with white truffle oil or black truffle oil, the flavor of the summer truffles will be enhanced. 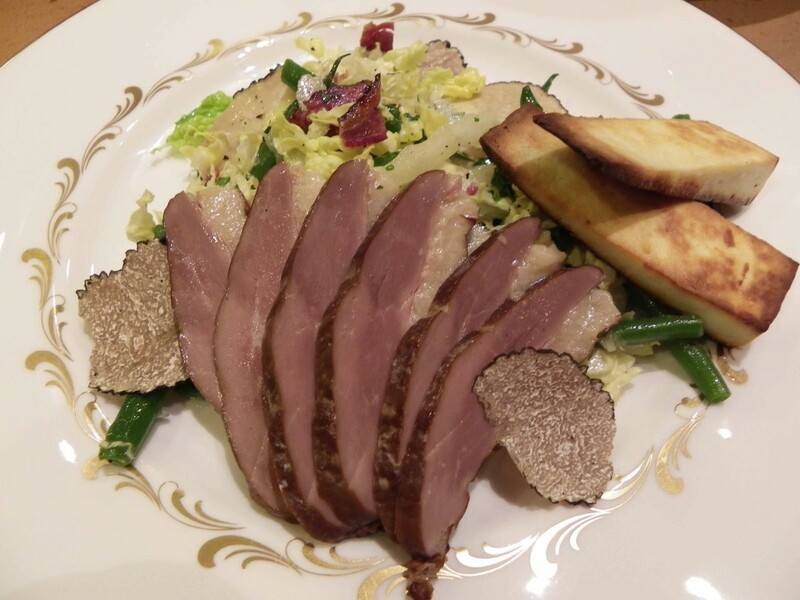 This recipe for Smoked Duck and Summer Truffle Salad is easy to prepare and light but very flavorful. The perfect summer salad! First, prepare the vinaigrette. Whisk together lemon juice, shallots, and mustard in a small bowl. Whisking constantly, add the olive oil in a thin stream until well blended and emulsified. Whisk in the truffle oil, using more if you desire a stronger truffle flavor. Season with salt and pepper. To make the salad, begin by bringing a large pan of salted water to a boil. Add the haricots verts and cook until crisp but tender. Drain the beans and shock them in ice cold water. Drain again and set aside. Brown the duck bacon in a large skillet. When the bacon is slightly crisp, remove from pan and cut into 1/2 inch pieces. Preheat the oven to 450 degrees. Grease a medium baking pan with olive oil. Cut the ricotta salata in 6 equal wedges, then cut each slice on the diagonal into two triangles. Arrange the slices on the baking sheet, then bake until the cheese is golden brown, about 6 – 8 minutes. Meanwhile, shave the truffles in thin slices. In a large bowl, combine the cabbage, green beans, parsley, duck bacon and truffle slices. Gently mix the salad ingredients. Add the vinaigrette and toss to coat, making sure not to break the truffle slices. To serve, divide the salad between six plates. Arrange the sliced duck breast, and place two warm slices of ricotta salata on each plate.